I have no time for them all of a sudden! Possible a bit harsh, but I understand where you are coming from. Nothing to do with the ZyXel it would seem. Happy to report that interleaving has disappeared off the line after 48 hours. X6 speeds back to approx 70Mbps. Single thread still poor in comparison. Yes, but your margin is way above the target, so I'd expect any VDSL2 modem to get the full 80 with ease. When modems consistently sync faster than others but report higher error rates, it's usually because they're measuring the margin more aggressively. And indeed your ZyXel stats report a higher margin than the Huawei's. Both of those high margins are expected, and in the size order they are, because both are sync'ing at the maximum cap for the product. The 3kbps below 80,000 is also normal. I think the lowest I have seen on a "full" 80/20 sync is 79,996Mbps. 79,999 being the highest. The margin above 6dB would be used if the line were allowed to sync at the Max/Attainable rate - 111.343Mbps on the XyXel and 103.792Mbps on the HG612. Current margin measurements mech closer to the Huawei today, at least on the downstream side. The 3kbps below 80,000 is also normal. I think the lowest I have seen on a "full" 80/20 sync is 79,996Mbps. 79,999 being the highest. 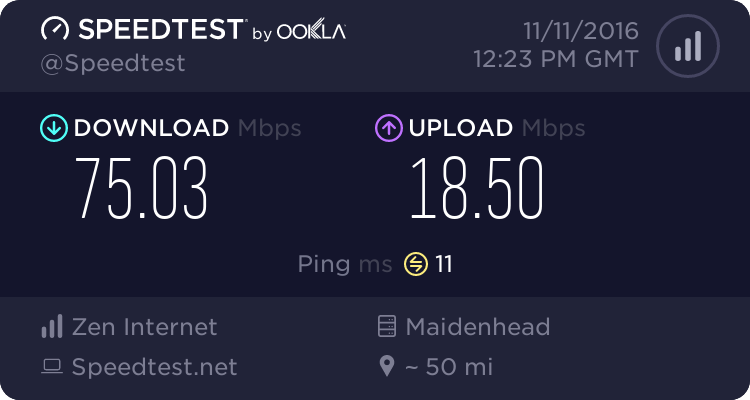 Just come back off our hols and made the deciision to upgrade the line to a business connection. No discernible difference between the before and after beyond the normal variation in speed test results. I have validated the single thread speed, by downloading a 512MB file compressed TBB data file. which downloads in just under 100s, giving a speed of 43 Mbps. Not sure where to go from here. If I stay with Pulse8, then I may just downgrade to the 38/10 product and save myself some dosh. I have had a preliminary email chat with some possible alternate ISPs, but there is a significant cost to reverting back to a BT line with the ISPs I would choose to go with. Uno would be a good option, if they ever get their Talk Surf Fibre product launched. Not sure if there is any difference at all. I always thought Pulse8 used the TTB network anyway. So the priority would be the same on both connections? Re-sellers packages are built to suit the ISP. Uno route differently to Pu;lse8. I had a perfect service from Uno, whereas the apparently same resold service from Pulse8 was poor with lots of errors. That said, Pulse8 tried their best with my line as are my current ISP. My understanding is that there is a similar difference between the Home and Biz packages. The P8 web site refers to the Home packages being standard priority and the Biz packages as being high priority, so I anticipate there is some prioritisation differences. In reality, the additional prioritisation isn't make any discernible difference.